The 46 participants in the Meeting came from 10 countries. 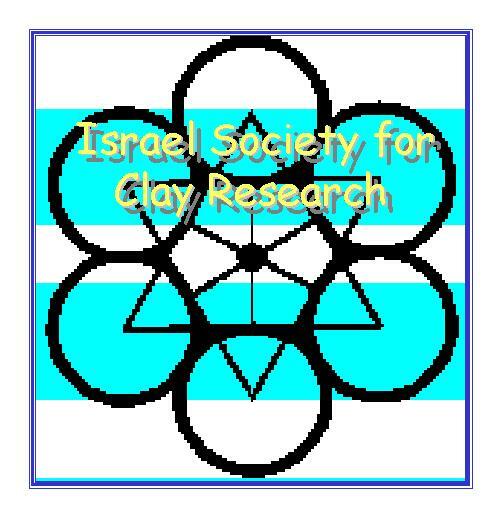 The Third Meeting organized by Societies for Clay Research in Mediterranean Countries took place in Jerusalem. The Conference was devoted to the chemistry, physics, and geology of clay minerals and their applications in protecting the environment, in agriculture and in industry. An important aspect of the Conference was to promote cooperation between scientists of Mediterranean countries. We hope that this Conference contributed to attempts of achieving peace and raising hopes in the region. 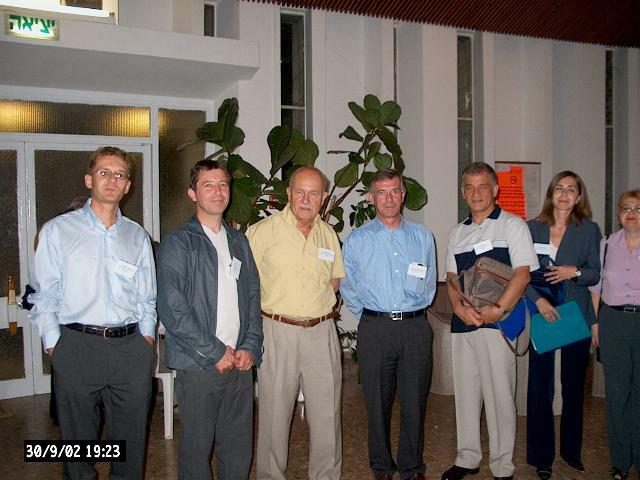 The Israel Ministry of Science, Culture and Sport was a coorganizer of the Meeting. The first scientific session of the Meeting, which dealt with Environmental and Agricultural Applications of Clay-Minerals, was dedicated to the presentation of several achievements obtained throughout the three years of joint activities of several groups in Israel which collaborated in a large national project ���Tashtiot���. This project, funded by the Israel Ministry of Science, Culture and Sport proceeded during the period April 1, 1999 ��� July 31, 2002. The session also included contributions by several guest speakers from Europe and Israel. The Meeting was also sponsored by The Hebrew University of Jerusalem and additional contributions were obtained from: The Israel Ministry of Agriculture, The Open University of Israel and The Peres Center for Peace. The Meeting took place on the Edmond J. Safra Campus (Givat Ram) of the Hebrew University of Jerusalem, Chemistry Building (Los-Angeles); Seminar Hall (Upper Ground Level). Reception at the Belgium House. and Commercial Counsellor, Embassy of Greece; and Organizers of the Meeting. Design and Production of Environmentally Friendly Pesticide Formulations. J.P. Besse (France) : Interactions of Anionic Clays and Pesticides. 11.15: Z. Gerstl, A.Nasser & U. Mingelgrin (Israel) : Chitosan Clay Interactions. for Adsorption of Organic Cations to Soils. a Thin Soil Layer in Funnels. A Contribution to Thermal Studies of the Mixed Salt-Clay Rocks. of TA in the Investigation of Fe-Substitution in Mg-Chlorites. and for the Treatment of Industrial Wastewater. in View of Provenance Studies on Ancient Ceramics. during the Convergence Stage of the Neo-Tethys (Senonian to Eocene). Evening : Free: A visit to the Israel National Museum. Third Session - Spectral and Colloidal Properties of Clays and Clay Minerals. Investigation of Montmorillonite Mechanochemically Treated with Urea. Interactions of Kaolinite with Potassium Carbonate Revisited. Suspensions of Charged Clay Particles. Controlled-Rate Thermal AnKaolinite and their Intercalates. 13.45: R.A. Schoonheydt (Belgium) : Smectite Nanofilms. Quantum Rods: From Basic Science to Applications. clay-minerals in catalysis of reactions and recycling and treatment of water. Bifunctional Organo-Clays for Detoxification of Industrial Wastewater. Application to Mineral and Natural Clay Sorbents. 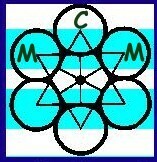 Water using Optimized Micelle-Clay System. Sources as a Means to Control Sulfide in Fish Ponds. Sixth Session - Geological aspects of clays and zeolites and their formation. Phases in Cretaceous Sediments as Evident from K-Ar Dating. (Middle Triassic to Lower Albian). and Rocks by Hydroxylamine Hydrochloride and Hydrogen Peroxide. Seventh Session - Clay deposits and their applications : Ceramics and Archeology. 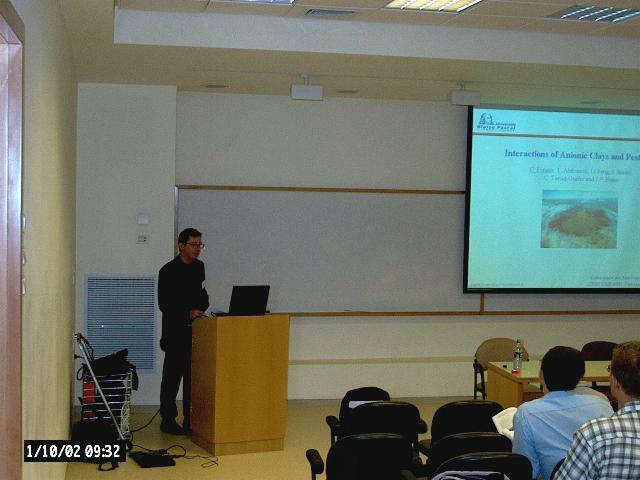 17.00:	S. Mishirqi (Israel): Industrial Applications of Clays. Illite-Rich Clay Based Ceramic Bodies. Casting Properties of Ceramic Clay Suspensions. Farewell dinner: (from left to right) E. Stepkowska (Poland), S. Yariv (Israel), J. Kristof (Hungary), S. Nir (Israel), M. and I. Lapides (Israel), S. Salomon, L. Heller-Kallai (Israel), E. Stepkowska (Poland) and Z. Kallai (Israel). The Journal of Applied Clay Science will devote a special issue to papers submitted by the participants of the Conference. All papers will be refereed by two expert and independent referees as ordinary papers of the Journal. Manuscripts may also be sent by those who sent Abstracts, but did not attend the Conference. In case you did not bring manuscripts to the Conference , please send manuscripts in topics #1, 2, 6 to Dr. Shlomo Shoval (Guest Editor), Geology Group, Department of Natural Sciences, The Open University of Israel, 16 Klausner St., Tel-Aviv 61392, Israel before December 31st, 2002. Manuscripts in topics #3, 4, 5 should be sent to Prof. Shlomo Nir (Guest Editor), Dept. of Soil & Water Sciences, Faculty of Agricultural, Food and Environmental Quality Sciences, The Hebrew University of Jerusalem, P.O. Box 12, Rehovot 76100,Israel before December 15, 2002. Geological aspects of clays and zeolites and their formation. Spectral and colloidal properties of clays and clay minerals. Environment and Agriculture I. Applications of clay-minerals in the design and production of environmentally friendly pesticide formulations. Environment and Agriculture II. Application natural or modified clay-minerals in catalysis of reactions and treatment of water. Clay-minerals as nano-particles and nanotechnologie. Clay deposits and their application: Ceramics and Archeology.